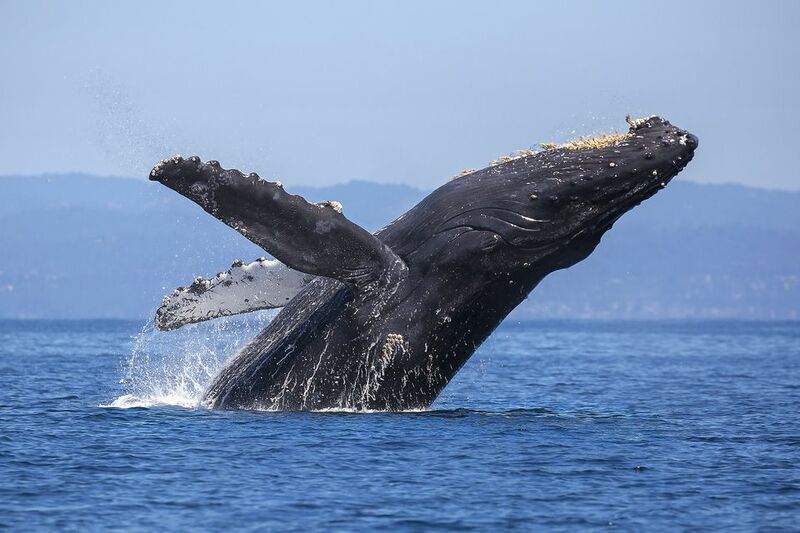 Whale-watching in the San Francisco area centers on the region around the Gulf of the Farallons about 25 miles offshore, where whales cruise through a 20-mile wide ocean "highway." While an occasional curious cetacean (that's science-speak for whale) may venture into San Francisco Bay for a bit of sightseeing, they generally stay further offshore around San Francisco than they do in other parts of California. For you, that means whale watching cruises can take up most of a day. In addition, it can be cold and windy and rough water can provoke motion sickness. If you check online ratings of San Francisco whale watching tours, you'll find some surprisingly low average ratings. Dig a bit deeper and you'll find that ratings are split. If the reviewer saw lots of whales and other sea animals, the rating is high. If not, it's low. Many reviewers also complain about the cost of tours, no matter whether they liked it or not. Our advice: Be realistic about how much you want to see the whales and whether you'd rather spend the cost of a tour on something else. Some tour operators offer a free return if you don't see any whales, but consider whether you'd really want to spend another day on the boat. Very young children may not be allowed for safety reasons. Unless otherwise noted, all of these tours offer a whale sighting guarantee: they'll let you go again at no charge. San Francisco Whale Tours: Naturalist experts are on board. Use the code FMSA when making your reservation and the tour operator will make a donation to the Farallones Marine Sanctuary Association. Oceanic Society Cruises: This non-profit groups offers limited sailing schedules but have the best-trained naturalists. Their trips are longer than others and depart from Sausalito or San Francisco. Online reviewers who take their tours seem generally happier with the experience than with others. They do not offer a sighting guarantee. California Whale Adventures: This tour is operated by Captain Jacqueline Douglas, who has more than 30 years' experience. Their website does not mention a sighting guarantee. The best places for San Francisco area whale watching from land are along the coast south of the city. Marin Headlands is just north of the Golden Gate Bridge in the Golden Gate National Recreation Area. Try Rodeo Beach. Point Reyes National Seashore provides a shuttle on weekends and holidays, which runs from Drake’s Beach to whale observation areas at the Lighthouse and Chimney Rock. A few whale watching cruises go out from Half Moon Bay, but they are unlikely to go as far north as the more interesting Farallons. No matter where you watch the whales, the basics are the same. Get tips for picking the best cruise, plus advice on how to have the most enjoyable experience in the California Whale Watching Guide. The Ultimate Three Day Guide to S.F.